Easter, already? Yes, Easter is April 4 so its time to think "Spring." Yeah! Sunshine, bright and pastel colors, lots of green - what could be better? 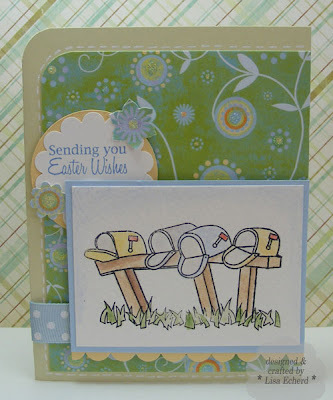 This stamp set, Mailbox Greetings, from Papertrey Ink is new to me and contains loads of sentiments - just about any occasion. I know I'll use this one for a lot of Operation Write Home cards in future. 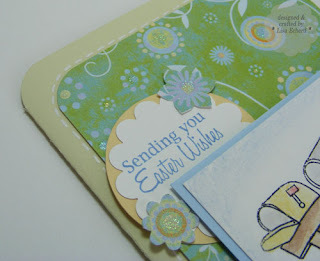 This DCWV designer paper from my stash just said spring to me with its lovely soft colors so I decided to get going on some Easter cards. 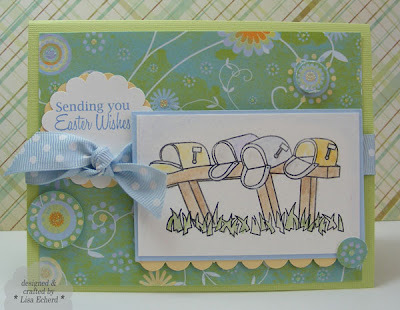 I punched out a few of the images from the designer paper scraps using flower punches to balance the sentiment. Spring, here we come!